For reasons I cannot even begin to understand I have yet to write an article showing more about the bearings we sell here. 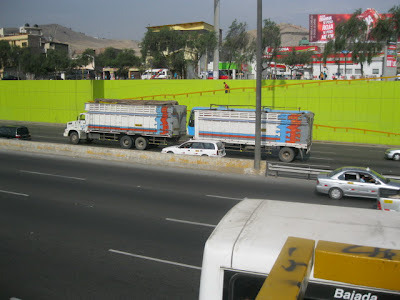 For newer readers who have not read about Ameru, you might want to look here, my article introducing Ameru Trading del Peru S.A. from last June. In various of the pictures below, I have included the rubber gloves I used when handling many of the bearings. Oil on people´s hands actually will start the corrosion process, so for each bearing I took out of its protective packaging I used gloves to handle them. The combined total value of all of these bearings is about $500.00. That above IJ-212001 Assembly is our 2nd biggest seller (dollar volume) bearing in 2012! Both KBC and Iljin are Korean manufacturers of rolling bearings, and Ameru represents both companies here in Peru. The next picture shows most of the bearings used in the Daewoo Tico car, the little car that is in the first picture of my last article. At the bottom right, there is a box and a bearing just above it (in its plastic cover), this is KBC´s 6205ADHC3, the rear axle ¨inner¨ (towards the middle of the car) bearing. The vertical similar looking pair just to the left of those two (flanking my Miami pen) is a pair of KBC´s 6204-DD, the rear axle ¨outer¨ (towards the outer part of the vehicle) bearing. 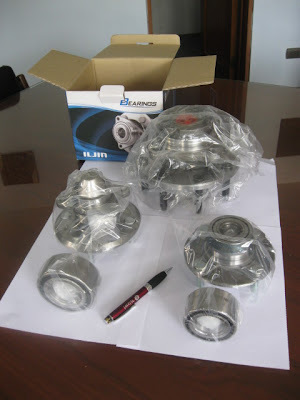 The back row of bearings (two in their boxes and two stacked together) are all KBC´s 6007AHL1DYCX (or 6007-RS in ¨generic bearing language¨), all four of these are the front axle bearings (inner and outer, both sides, so total of four of these per Tico front axle). KBC´s 6007-RS is our biggest selling bearing, we have sold over $1,000,000 worth of this piece since 1999! The two pieces to the left of my pen above are both oddball bearings. The larger piece (in plastic) is a ball bearing with a thick inner race, while the other piece is a ¨needle roller bearing¨ (look carefully and you can see the steel needle-like pins in the black plastic housing), both pieces are used in the Tico´s transmission. 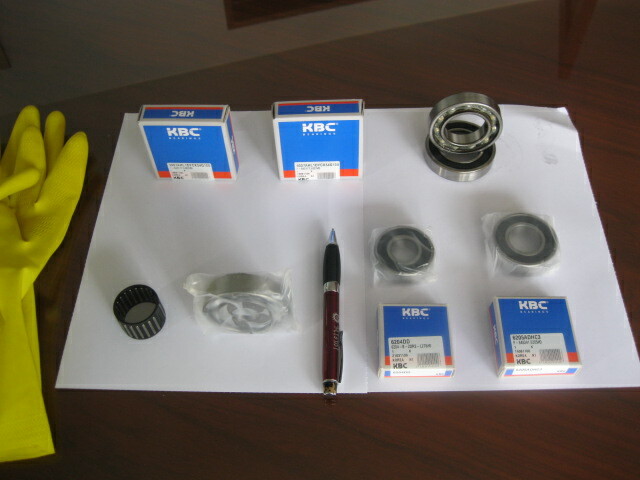 KBC makes a reasonably full line of bearings, but especially in the smaller standard pieces. Not to mention many pieces for Korean cars. The next picture below are five pieces from our Korean supplier Iljin. Iljin is the largest manufacturer of wheel bearings in the world! The two pieces in front on the right are the two wheel bearings for the modern Hyundai Accent, a car that is popular both in the USA and Peru. The smaller piece (IJ-111001) is for the front axle (and is another example ofa Generation 1 bearing, but this one uses steel balls rather than rollers). The larger piece is IJ-112001, another Generation 2 bearing, and is used on the rear axle. The pair to the left of my pen is a similar (but both pieces are slightly larger) used for the Hyundai Sonata, also found in the USA as well as Peru. The larger piece of this pair happens to be a Generation 3 bearing, the main difference between Generation 2 and Generation 3 is the latter is even bigger and a more complex piece. Again, the auto manufacturers are all trying to get their suppliers to send them fewer pieces for them to assemble. The Big Bad Boy in the back is another Generation 3 bearing (IJ-223020, this uses tapered rollers as well)), and is actually our biggest (heaviest anyway, over 25 lbs!) bearing. It is for the Ford ¨Super Duty¨ pickup truck, it is the original piece for that truck. Yes, Ford and GM both buy LOTS of their current wheel bearings and assemblies from Iljin! Iljin also supplies (on an OEM basis, that is the car companies use Iljin pieces as their original parts) Peugeot, BMW and Chrysler, among others. 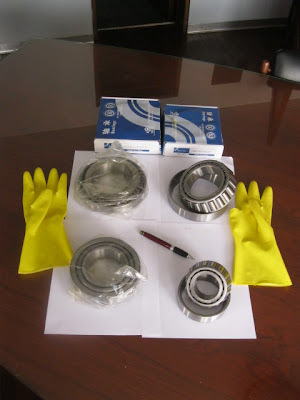 The next picture below shows some large tapered roller bearings that we buy from China (for the ¨Precio Nada Mas¨ group of customers we have here in Peru), ZWZ brand. The tapered roller bearing was invented by US company Timken about 100 years ago. Many in the USA still use the informal term ¨Timken Type¨ when referring to this type of bearing. 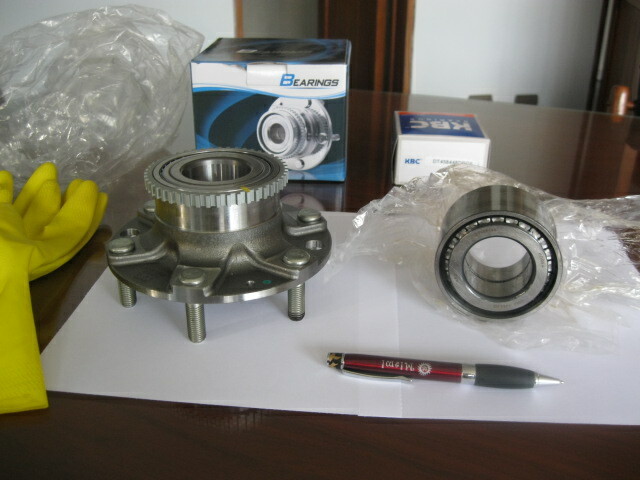 This type of bearing comes in two pieces, the ¨Cone¨ and the ¨Cup¨. The cone has the conical shaped (not clearly seen here) rolling steel elements (rollers) within it, and the cup is the outer raceway for the cone and rollers. To make this slightly clearer, I separated the two bearings on the right, putting the cone on top of the cup to show you what the two pieces look like on their own. The two bearings on the left I left them in their plastic to show you how they look when fitted together, the front piece is ¨face up¨, and the back piece is ¨face down¨. The two pieces on the left (bearing numbers 663/653 in front and the 687/672 in back) are the two bearings used in Volvo trucks found all over the place here in Peru. I was not able to take a picture of a Volvo truck for the last article, because all those pictures I took on Saturday, when fewer heavy trucks are at work. The last photo of this article will be one with a Volvo truck. The piece in front on the right is used for the Volvo´s front outer bearing (537/532X), the bearing for the inner bearing we do not have, not many factories make the 6386/6329 piece. Instead, I present (at the back on the right), ZWZ´s HM518445/10 used in Fruehauf (an old US company, I do not think they are still around) trailer axles. The next picture shows bearings from our supplier MBS of Japan. MBS is fairly small among bearing manufacturers, they do not even try to make the thousands of variations that the biggest companies do. MBS does make some nice pieces of interest to us here in Peru however. They make a fair number of unusual bearing types, many of them for older American cars, there are MANY older American cars still surviving in South and Central America! They also make some Generation 1 pieces, some of which are very popular for us (wheel bearings for Toyota for example). The piece at the lower right is their M309726BD, a Generation 1 piece used in MANY cars, from Europe, Japan and Korea. The four unusual separable pieces in the middle are bearings for steering columns of American cars and trucks. The piece at the lower left is a clutch bearing (aka clutch throwout bearing) for Suzuki Swift (not found in the USA). The piece at the back on the left (larger) has a number of features of interest (at least to people in the bearing business!). I enlarged this photo as much as I could to show details. If you look at about ¨8:00¨ (slightly below the extreme left) you will see a gap in the ¨snap ring¨, a small black-colored steel ring mounted on the outside of the bearing that locks it into place, this is often found in bearings for transmissions (this piece is for the transmission of old Ford large trucks). Another feature of thyis bearing is that it is relatively thin, it is not as wide as the normal bearing. The other unusual feature of this bearing is that they were able to squeeze one more steel ball inside there... How did they do that? If you look very carefully (hey, I used to be a photo interpreter and know how to look at pictures very carefully!) at about ¨2:30¨you can see two carved out pieces in both the inner ring and the outer ring. These two, when lined up as here, allow MBS to pop in one more steel ball for extra weight carrying capacity. Buying bearings is the closest thing I have to a ¨day job¨. Welcome to my world! Thanks Robert. Nice to see a window into the business you talk about frequently. Congrats on the strong sales. Hope it lasts well into the expected economic storms. I seem to find myself struggling with all the ones you describe at intervals with those needle roller outer cases my most hated when it comes to removal of the old ones. Qingdao Ruist LTD for sell bearings 50 years in China, supplier original NSK FAG SKF INA etc and Chinaes ZWZ TCC HCH LK etc, hope to be one of your supplier. If your are interested please contact us at your earliest convenience. Really Nice blog.. like it very much..
above all bearing we are manufacturing. our brand is DLT. Those are really fine qualities of a good bearing. In fact the best bearing have all those standards too. 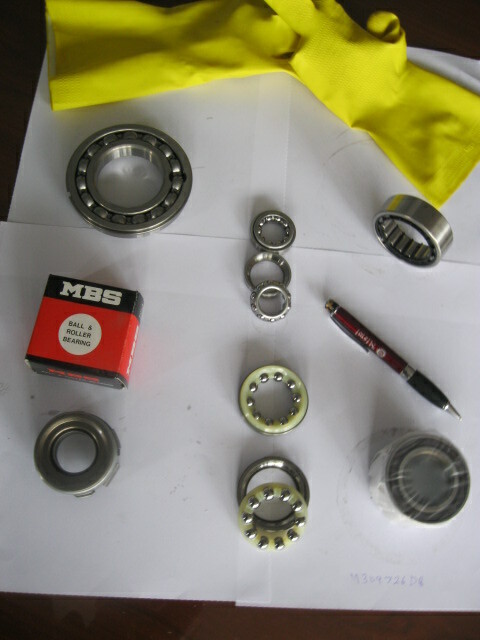 We supply various types of ball bearings suitable for various industrial and domestic machinery equipments.